These machines were powered by municipal water which at the time was of poor quality. So they were used to pump well or rain water to buildings. This water was used for laundry and cooking. Gradually water quality improved and so these machines were no longer needed. This machine is in very good condition with its original paint. I believe it dates before about 1910. This is based upon the fasteners used on the cylinder heads and what would be called the steam chests if this were so powered. They are #14 -20 threads with a major diameter of 0.236". Later around 1910, the Unified Thread system was introduced and this fastener became the 1/4" - 20 NC thread. The hex head screws seen in the photo have since been replaced by cheesehead screws that I made from brass stock. The leather wrapped bronze pistons had disintegrated on both the pump and power sides and various fasteners were missing. The piston rods (brass) were worn. While strictly speaking it's not an engine it seems to certainly have retained those origins in its design. I would welcome any additional information about these machines. Were similar machines found outside the USA? What an interesting "engine" Phil. It should be a fine showpiece after your renovations. Actually from the outside, it looks to be in great shape now! Never heard of such a thing....but I can understand their existence!....thanks for sharing that! In one of my old books on hydraulics, "A Treatise of Hydraulics" by Prof Henry T. Bovey McGill University, Montreal, second ed 1909. He warns of the need to restrict the rate of flow to a maximum of 10ft per second, and preferably much less. Some of these motors were quite large,(quote)The water-pressure engine is necessarily a slow-moving machine, and is both cumbrous and costly unless actuated by pressures of great intensity. These engines are advantageously employed in working cranes, hoists, elevators, capstans, dock-gates, presses, and other machinery in which the action is of an intermittent character. One important thing he points out is the need for a very free exhaust, there is no compression in water. I have been intrigued by the 3-cyl versions described and pictured on that site. I've had one of these socked away for a future project. 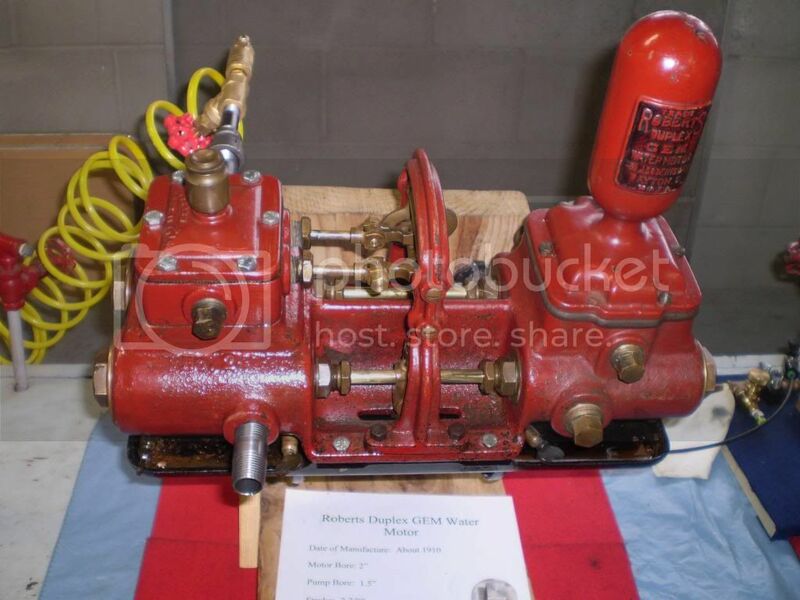 I assumed it was a steam pump, but never thought it was water powered. It's got the cast iron "shelf" under it and angled wall brackets. Very cool! I've restored mine to the extent that it will run on compressed air as you can see and at some point I may take it down to Kinzers R&T and put some steam to it. It's socked away so I'll have to get it out some time to confirm, but I'm 98% sure it is just like yours. Really nice looking unit. I have a Marsh single and Knowles single as well. Hoping some time to go through them all for display and/or use. My father and I removed one of these from the basement wall of Victorian home in the mid 1960's. It was still plumbed in place. I was in late teens. He found new leather cup seals at work, (he was maintenance supervisor at a large plant) and I reconditioned it to work. It was great fun to watch run on compressed air and sometimes city water to pump water between buckets. A friend ran it on city water to help pump water out of his flooded basement in the 1970's during a power outage. It hadn't run since and "leather cup seals" have dried up. I have disassembled to rebuild again. I am trying to find a source for new cups. Internet search brings up pictures, but no contact info so far. I also have the "shelf" and wall brackets. Very interesting, never heard of that one before. I seem to recall that London's Tower Bridge was originally powered by a water engine, but that was changed some years ago. Dogs look up to you, cats look down on you, pigs treat you as equal. Bad Behavior has blocked 15630 access attempts in the last 7 days.